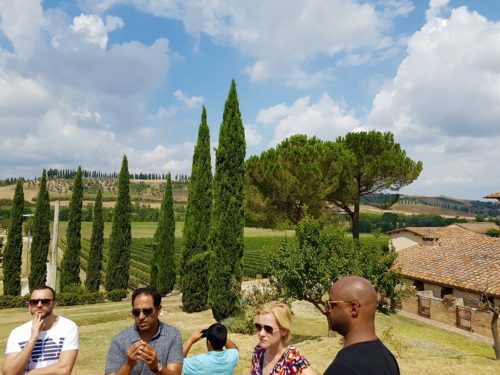 I had no idea what type of wine tour to choose for my guests the day after our wedding in Chianti. 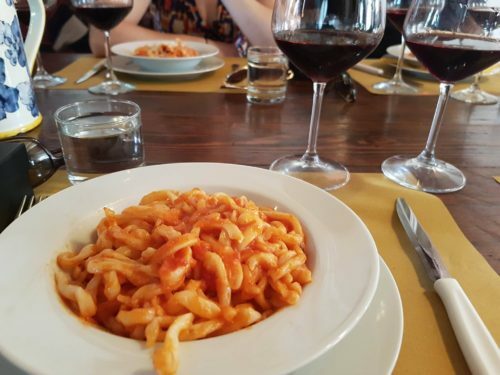 It needed to be the quintessential Tuscan winery experience. Many had flown in from different parts of the world. 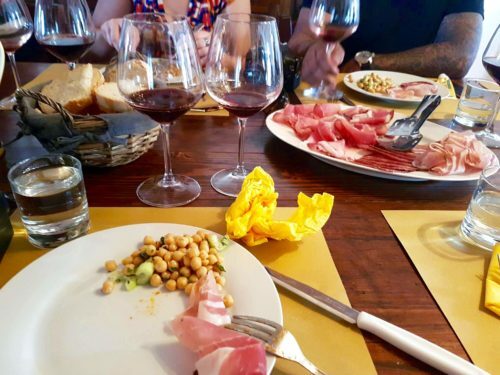 It was important to choose an option which provided a sampling of great wines along with that instagrammy, picturesque Tuscan landscape. In hindsight, a 9am pickup the next morning may not have been the best idea. Hungover with little sleep, we navigated the windy and hilly roads from Chianti to Montalcino with little conversation and moderate nausea. 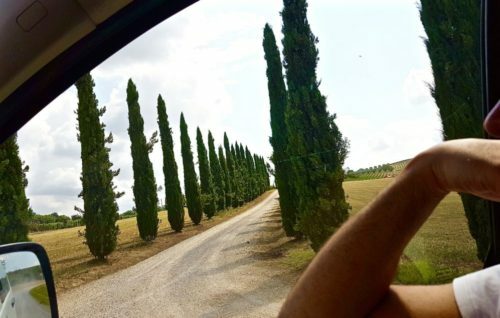 The scowling faces mostly subsided once we pulled up to the cypress lined driveway of Santa Giulia. 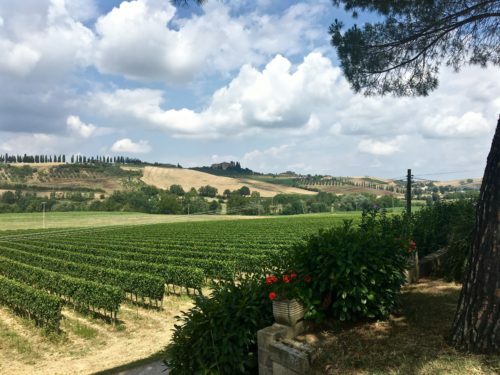 The tuscan winery is a beautiful 18 hectare agricultural estate producing Brunello and Rossi di Montalcino wines as well as grappa and olive oil. 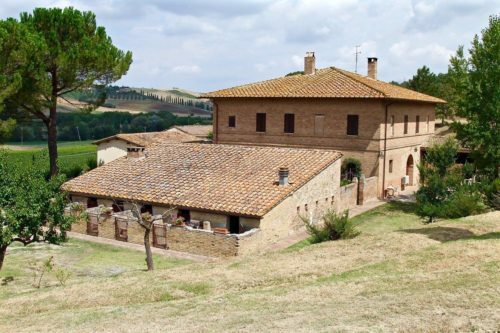 They even raise the famous cinta sinese designated black pigs indigenous only to Tuscany. The precision sliced pork cuts hailing from the coveted pigs were on a level I have never tasted. Eating swine elsewhere will never be the same again. 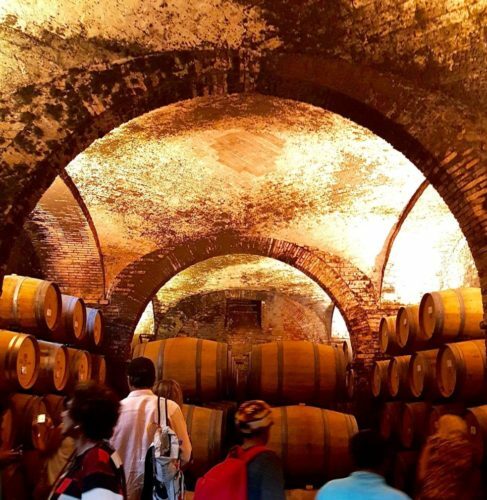 We started our tuscan winery experience with a tour of the vineyards. 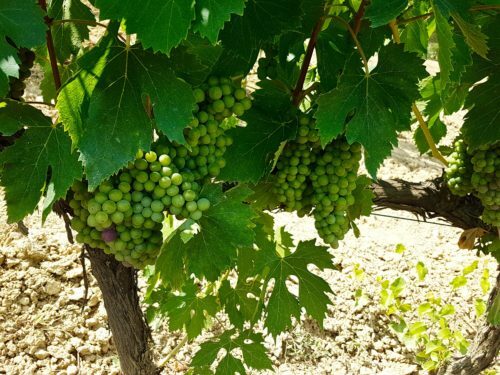 We learned of the cultivation and harvesting methods of the widely planted Sangiovese grapes. Moving on to the cellars, our guide spoke of the barreling and modern fermentation techniques used to produce their wines. And finally, we ended up at a long wooden table where we ate and drank our waistlines away for about two hours. No more complaints of nausea would be entertained as I witnessed everyone feasting like they were headed to the electric chair. The 2010 Brunello was my absolute favorite. And the meal, one of my most memorable during my time in Italy (mostly due to those black oink’ers :)). Nothing complicated, just fresh and simple ingredients. 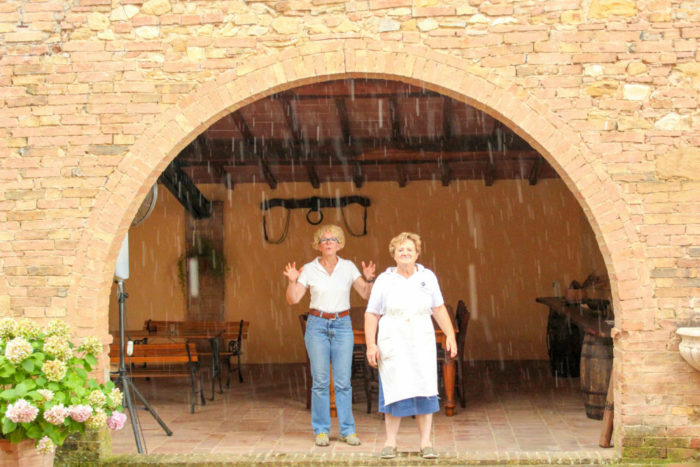 The homely cook at the estate (on the right in the main photo) was the epitome of Italian hospitality. She brought out additional helpings and offered gluten free options. It began to rain mid way through our meal. Some of us went outside and danced around. Our gracious hosts probably thought we were nuts. But with half the wedding party flying in from Dubai and California, rain is an opportunity not to be missed especially in a location as spectacular as this. 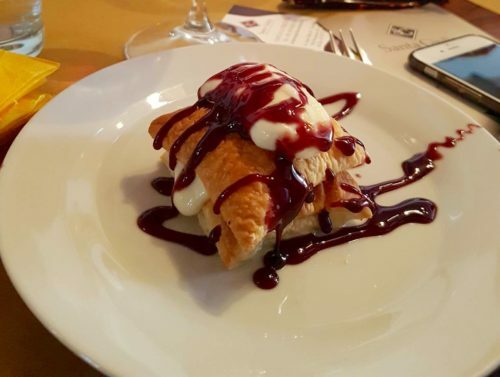 One of the pics from our wine tour.